From 1938-1942 WPA workers were assigned to annual work projects in the University Gallery. The main duties of their work consisted of developing an art reference service to support instruction at the University. Workers also created circulating exhibitions comprised of visual aids for teachers. These visual aids were matted, framed, and compiled by the WPA employees and distributed by the Junior League Clubs of Minneapolis, St. Paul, and Duluth. Exhibitors from elementary and secondary schools, teachers colleges, and other small arts organizations throughout the state could rent the visual aid exhibits for a fee that covered postage. Found within WAM’s collection of exhibition catalogues was a stapled report titled, “Visual Aids to Teachers of Art” that included descriptions of the exhibits and how they could be rented. 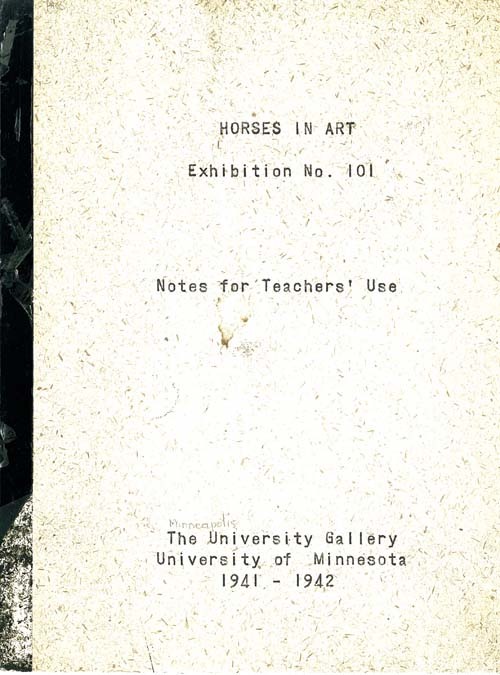 A booklet titled, “Horses in Art, Exhibition No. 101” was also found. This booklet, which contains instructions and a sample curriculum, accompanied the exhibit materials. Exhibits were comprised of 10 reproductions of old and contemporary artwork that were mounted to boards, designed to be set in the grooves of a chalk well and rest against classroom blackboards. A fire of undetermined origin burning for more than half an hour in the organ blower room, 303 Northrop auditorium, yesterday destroyed almost all of the art displays, and equipment stored in the room. About $250 worth of picture frame moldings, ten elementary school art exhibits and numerous picture display board were burned. 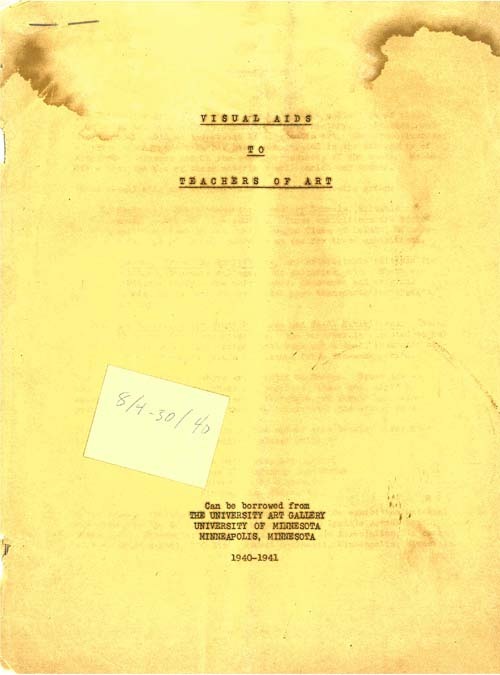 Thanks to the WPA project reports, the existence and preservation of posters and catalogues, as well as additional resources such as the PDF Archives, we are able to learn more about the unique services and programs that the Gallery once provided.